Built around 1890, the three-room schoolhouse was named New Hope School and served white students until 1914. In 1921 the Nelson School opened for black children under the direction of Rachel Hull Monteith. The school was renamed in her honor in 1932. One of her daughters was the prominent civil rights activist Modjeska Monteith Simpkins. Another daughter Rachel Monteith taught at the school and sued the school district in 1944 claiming African American teachers were paid less than white teachers due to race. Thurgood Marshall of the NAACP represented her in court before going on to argue and win the Brown vs. Board of Education case before the US Supreme Court in 1954. Rachel’s daughter Henrie Monteith was one of the first three African Americans to be admitted to USC in 1963. The school building was moved from across the street around 2002. 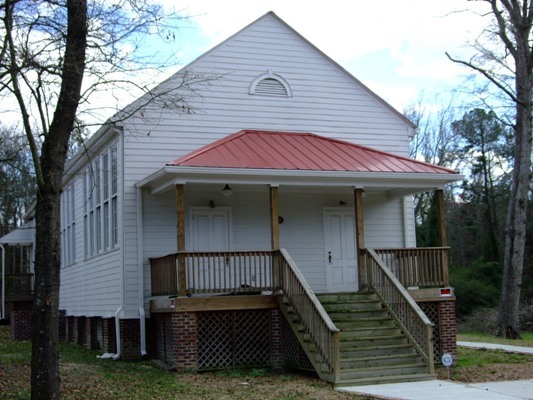 It has been restored and is home to the Booker T. Washington – Monteith Cultural Center.